Snowmobiling in Aspen is a must-do activity for people of all ages and abilities craving time to explore Aspen's natural winter beauty. 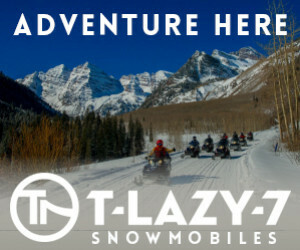 T Lazy 7 Ranch - Premier Snowmobile Trips! 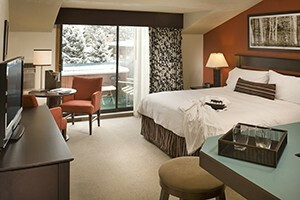 Aspen's premier snowmobile tour provider. All tours include experienced, knowledgeable guides. 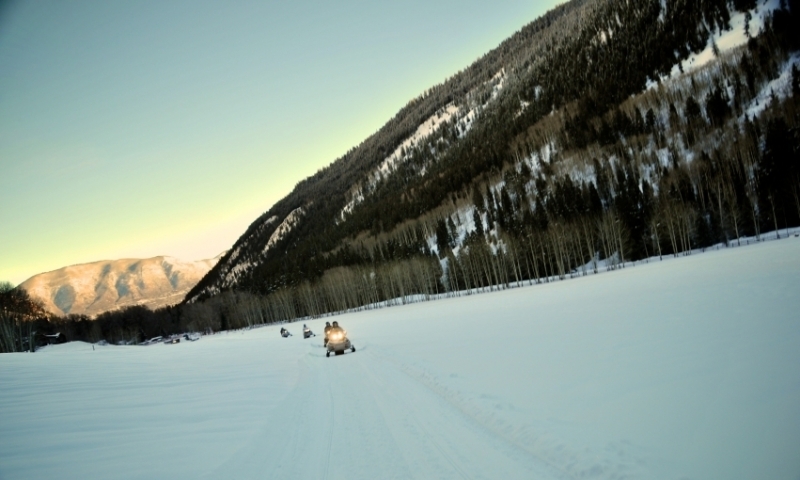 Snowmobile tours to the Maroon Bells, Independence Pass, & Klondike Cabin. Area experts ready to put together the right adventure for you and your family. Winter or summer, we'll help you plan the perfect trip. Spectacular mountains, breathtaking valleys, a historic town and exciting adventure are just some of the things waiting to be discovered on our fantastic tours. Low cost rentals for any adventure - Avalanche Beacons, Airbags, Shovels/probes; GoPro, Garmin InReach Sat Phones, PLBs and more. 2 way shipping to your home or hotel. Tour prices range from $240-$390 and often include a meal and hot beverages. Trips to the Maroon Bells typically take two hours and depart twice daily. Trips to the Klondike cabin typically take three hours and depart twice daily. All tours are led by knowledgeable, experienced guides. Reservations are required. Plan to arrive 30 minutes before the tour begins. Aspen has some of the most scenic backcountry snowmobile terrain in the country, delighting both beginner and advanced riders alike. 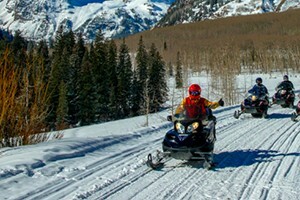 Snowmobiling to the base of the world-famous Maroon Bells mountain peaks is the most popular snowmobile tour in Aspen. The Maroon Bells are one of the most photographed locations in North America. Though the "Bells" are closed to vehicles in the winter months, they are accessible by snowmobile. This allows snowmobilers the unique opportunity to see (and photograph!) the Maroon Bells in all their snow-covered glory. Total tour time is typically two hours. Another popular tour takes riders through thick Aspen groves to the Klondike cabin, offering spectacular views of the 14,000-ft Pyramid Peak. Once at the rustic Klondike cabin, riders will hunker down to a hot meal, featuring ranch-raised, grass-fed beef. Total tour time is typically three hours. If you have some experience on a sled and are comfortable going it alone, consider renting a snowmobile in Aspen. Aspen snowmobile guides will take you to the best play meadows, the deepest powder stashes and the best high-mountain cruising that only experienced Aspen snowmobile guides know about. Find local information on snowmobiling and learn about rules and restrictrions for riding snowmobiles in the backcountry. The Colorado Off Highway Vehicle Coalition offers information on all kinds of off road vehicles, safety, responsibility, and land use regulations.